Step off the motorcoach and walk through the front gate leading to the second floor porch of this 1789 building - the oldest structure in the city of Natchez. Join us for an American Queen exclusive tour of King's Tavern - a newly opened restaurant and bar, owned by Regina Charbonneau, a nationally renowned chef, and her husband Doug. Enjoy an exclusive tour of the distillery followed by a guided tour of the bar, located just next door. This Episcopal Church is more than 125 years old and houses six Tiffany stained-glass windows. This incredible church spans over 125 feet long, is 52 feet wide, and reaches 61 feet high to the apex of the roof. The church was constructed in Norman style, finished in red brick, though it showcases zigzag tracery which was highly unique to the style at the time. The stained glass windows may be the main draw – there are 34. They were given as memorials and six of them were created by Tiffany Studios in New York under the supervision of Louis Comfort Tiffany. Anchuca, meaning “happy home” is one of the most significant antebellum homes in Vicksburg and is listed on the National Register of Historic Places. It was built in 1830 and provided shelter for those suffering during the War. The word Anchuca derives from an Indian word meaning, “happy home”, which is the exact vibe this home gives off. Built in 1830 by politician J.W. Mauldin, Anchuca is now listed on the National Register of Historic Places. During the war, the house was used as a shelter for those who had suffered. Tour the home and its beautiful furnishings. Built in 1858, this building stands as the most historic structure in Vicksburg, hosting speakers and guests like Jefferson Davis, Ulysses S. Grant, Teddy Roosevelt, and others! Construction for this colossal courthouse began in 1858 and was completed miraculously just two years later in 1860 for $100,000. It was restored by Eva Whitaker Davis after the tornado of 1953 swept through Mississippi. Now, the courthouse is filled with countless artifacts including, confederate flags, portraits, the trophy antlers won by steamboat Robert E. Lee in an 1870 race, an original Teddy Bear given by Theodore Roosevelt, and much more! This museum was featured in Southern Living, Delta Magazine and Dolls Magazine. Enjoy a self-guided tour featuring over 1,000 dolls and toys dating back to 1843. At the Biedenharn Coca-ColaTM Museum, enjoy the wide variety of Coca-ColaTM memorabilia in an authentic candy store and soda fountain setting. This building is where Coca-Cola was first bottled in 1894. Here, guests can learn about Greenville and all the important events and people the town has to offer. The museum is home to many artifacts, photos, memorabilia and souvenirs dating back to the early 1800s. See personal objects of local past citizens, businesses or well-known historical present-day celebrities! The museum has plenty of information about the Greenville Flood of 1927, including many pictures and stories. This guided, extensive museum about Hebrew history was built in 1906. Located in front of the temple is an original carriage stone - used for passengers as they climbed in and out of horse-drawn carriages in the 19th and early- 20th centuries. The temple showcases original stained glass and an original working organ both from 1906 and extensive artifacts and memorabilia from WWII. Located in the oldest structure in Downtown Greenville, the Flood Museum depicts the history of one of the worst natural disasters the county has ever seen. View the flood artifacts and photos illustrating the flood’s impact during the long four months Greenville was flooded. Watch a short documentary illustrating the cause and effects of the Great Flood and the struggle of man against nature. The art center is home to the Armitage Herschell Carousel. This carousel was created in 1901 and is the oldest fully functioning Armitage carousel today. Mississippi at that time was still legally segregated, many people approached the owner about having separate nights for carousel rides, but the owner refused, he wished for everyone to ride together. Take a ride on this amazing machine and hear the whistle blow and travel back in time. Just a short distance from the dock, guests can find themselves in Greenville’s Trop Casino. The city’s newest addition includes a $6.8 million expansion including a riverboat and land-based casino. Enjoy the latest slots and table games or enjoy a fine dining experience at one of the casino’s extraordinary restaurants. This fine Gothic Revival Church, erected in 1907, is the second building of this parish. It was designed and financed by Father P.J. Korstenbroek, who served at the church for 33 years and was memorialized in William Alexander Percy’s “Lanterns on the Levee”. Many of the stained-glass windows came from the Munich studios of Emi Frei. Located on the second floor of the William Alexander Percy Memorial Library, the exhibit highlights a number of writers from Greenville. Many of those featured helped to create an extraordinary literary atmosphere in Greenville. Writers who have called the city home have won the Pulitzer Prize, National Book Award and O. Henry Award. Writers influenced by the creative ambiance here include William Alexander Percy (for whom the library is named) Shelby Foote, Walker Percy, Hodding Carter, Jr., Charles Bell, Beverly Lowery, Ellen Douglas, Bern Keating, Julia Reed and David L. Cohn. 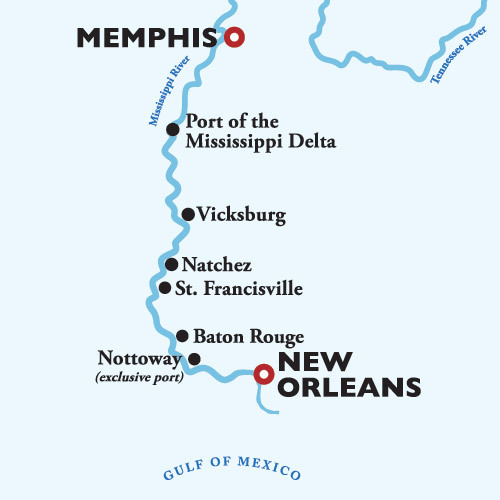 A TASTE OF THE TRUE SOUTH - Memory flows deep and sentiment eddies and swirls along the Lower Mississippi River. Experience authentic Southern culture as you journey through living history and soak in the romantic spirit of the Antebellum era.